Let’s talk about PBfit. In fact no, let’s hype about PBfit. If you’ve been following my Instagram you’ll know it’s been an addition to pretty much every breakfast/ snack I’ve made for myself this summer and I love finding new ways to incorporate it into my existing staple recipes. From my morning protein shake to my satay sauce this little powder has done me a solid. 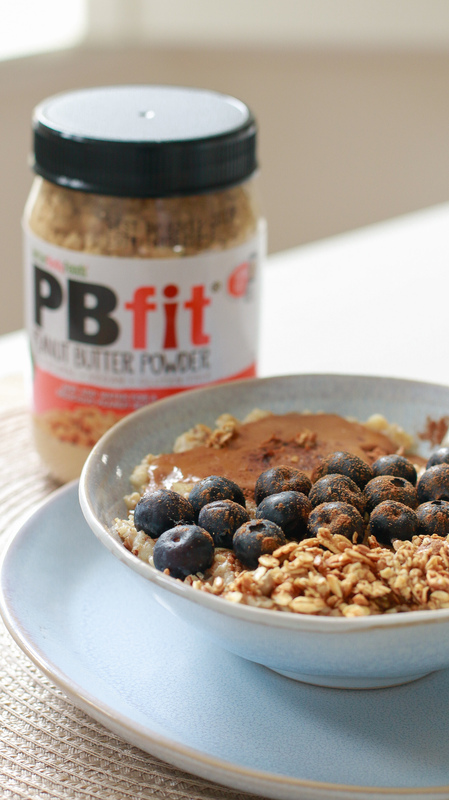 In case you don’t know what it is, PBfit is basically peanut butter in powdered form – which makes storing and travelling with it super-duper easy. Also, during the process of pressing and reducing the roasted peanuts (with the addition of a lil coconut palm sugar and a pinch of salt), the magical food scientists have managed to reduce the fat content by 87% when compared to traditional peanut butter (don’t ask me how, those guys are wizards). It also only has 1/3 of the calories of your average joe, run of the mill peanut butter – ideal for you gals watching your caloric intake & craving that nutty goodness. One of my favourite things to do with it is to whip it up – either with some oat milk or just water – to make it into peanut butter! Say hellllllo to the next generation of nut butters, the transformer nut butters! Here are three easy to make breakfast recipes using PBfit. They range from super quick to make porridge and shakes (for weekdays) – to your sunday morning stick-some-beats-on-and-boogie-while-you-bake banana pancakes. Add the oats, PBfit, oat milk, banana and chia seeds to a pan. Stir and allow to cook through until it reaches your preferred consistency. 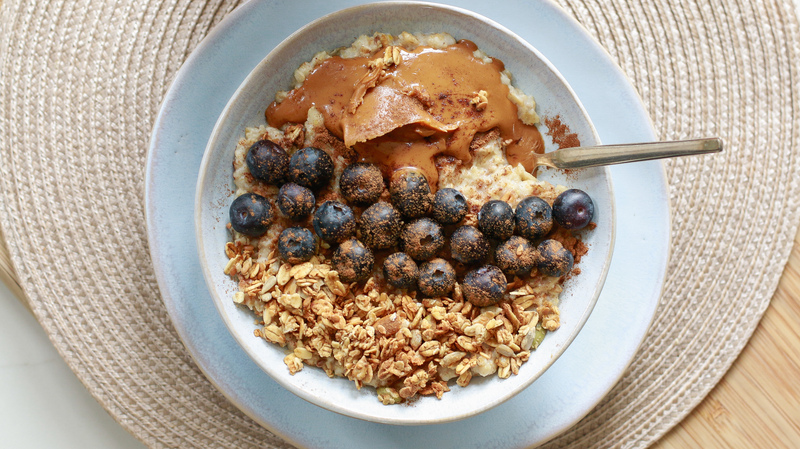 Top with cinnamon, blueberries, granola and some whipped up PBfit. Simply pop all the ingredients into a food processor, blend and enjoy! Sift the flour, PBfit, protein powder and baking powder into a bowl, and stir in 2 tbsp of the sugar. Mix together until a smooth batter is made. Heat oil in pan and add around 2 tbsp at a time to make each pancake. When you’ve added the batter to the pan pop the sliced banana into the uncooked side and cook until air bubbles pop on the surface. Slowly and carefully turn the pancake over (these pancakes are more delicate than egg pancakes). Cook for about a minute or so on the other side. Whilst you are cooking the pancakes add the remaining coconut milk and sugar to a pan and stir together until they simmer. Add a little pinch of salt and keep stirring. Reduce down until a single cream like consistency is formed. 10.Pour over your pancakes and enjoy! I hope you enjoy these recipes and don’t forget to tag me in your photos if you try them! This blog post is produced in collaboration with PBfit.